Fun & Creative Beach & Sunset Oahu Family Portraits! Honolulu & Waikiki family portrait sessions are outdoors on location, typically at the beach or a local park but can be done nearly anywhere. Lightness Photography is an Oahu family photographer offering one of a kind, stunningly gorgeous, family portraits on the sun drenched beaches and sunsets of Hawaii. Our Oahu family photography sessions are for families of all sizes and ages, from toddlers all the way up to their doting grandparents. We love kids and have lots of patience and experience working with both energetic and shy young ones. Keep scrolling for Packages & Pricing! Your Oahu family portrait session can be held almost anywhere, from nearby parks to deserted, off-the-beaten-path beaches and we will happily recommend the best location that fits your needs and desires. Family beach photography in Oahu can be anytime of day, from sunrise to sunset, though morning is often best for families with very young kids. (Pssst.... Check out our Testimonials Page for tons of reviews and photos of families just like yours! Lightness Photography offers unique, creative and stunning fine art Hawaii family portraits of you and your loved ones. We love to craft those "Wow!" portraits that you can't wait to hang on your living room wall. Golden sunsets, palm tree lined beaches, waves crashing in the background...why settle for mediocre family holiday vacation photos when you can have the best "EPIC," vivid and amazing family portraits? If you like the images you see here, we would love to be your Oahu family photographer! We believe life should be fun - it's when we play and have fun that our truest self shines through! 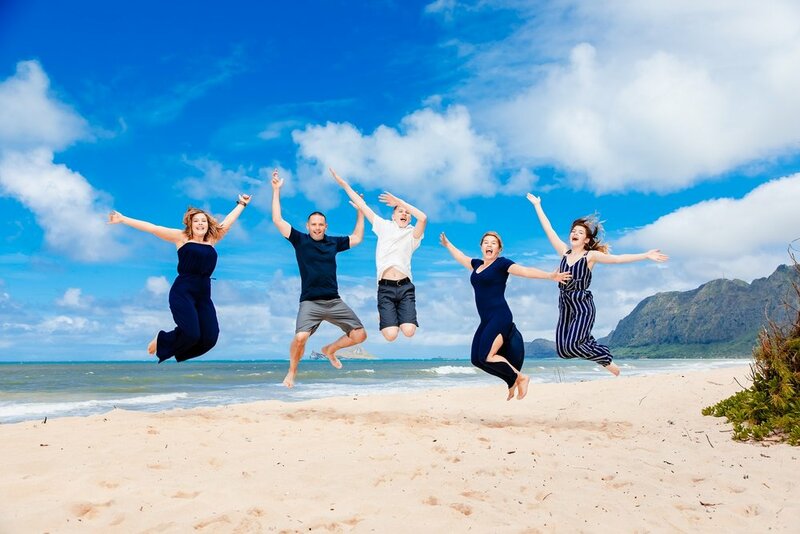 And family photography in Oahu is at its best when it captures that inner shine while simultaneously celebrating your connection with family. Please see our FAQ's page for more information on our family beach portrait photography. You can also see what it looks like to have a session with Bodhi by checking out the Behind-The-Scenes page! We have four basic family portrait packages available to cover nearly every budget. Each package can be used for Newborn, Children’s, Family, Couples & Maternity Ph0tography. Generally, you can expect to receive somewhere between 100 - 200 images from a 60 min session. This package is perfect for the family who wants a LOT of fun, cool photos. This can be used to cover a single 3 hour family event or divided into two separate sessions at different times and locations to get the most variety possible. Thank you! Your request went straight to our mobile phone so you will be hearing back from us shortly! A 50% deposit is required to reserve your Oahu family photography session. However, the deposit is 100% refundable if canceled more than 3 days (72 hrs) before your scheduled session. The deposit can be made on our Booking page. For suggestion on what to wear, what to expect, weather cancellations, etc, please see our FAQs page! Refunds are NOT given for anything beyond our control - like weather, wind, sunburns, rain, wet clothes, etc. Rescheduling due to weather is at our discretion only - but don't worry, we want awesome photos just as much as you do so we'll always do our best to work around inclement weather. In fact, we like slightly disturbed weather...it makes for more beautiful images! Worried about less than perfect conditions? Read this blog post! After your session, your Oahu family photographer will lightly edit all your images for maximum beauty and then upload them to an online gallery for viewing and print ordering. We will then schedule a personalized Review & Ordering consultation with you. During the consultation (in front of your computer), you'll be able to view and select your prints. Once you've decided on the prints and sizes you'd like to order, we will do a final touch up edit on your selected images before sending them to the printer. Besides the usual prints, there are many other great products that you may enjoy, such as custom crafted collages (see images below), canvas fine art, albums, photo books and more~. Please visit our FAQ's page for more information about family photography Oahu sessions, from what to wear, locations and what to expect. To what a family session looks like with us, check out our Behind The Scenes page! Visit our Facebook Page to see our most recent images and posts!